Green Peas Pulao / Pilaf | Simple and Delicious ! Pilaf / pulao is a simple form of making rice dishes mixed with meat or vegetables. Mine is a similar version of biryani, which is born once during usual experiments in the kitchen. So you can call it "green peas biryani" too. I made this for dinner with butter chicken, and was loved by everyone. It has been long since I participated in any blog event, so after a long time, sending this to Monthly mingle hosted by Nag's. Grind garlic ginger and green chillies together. Boil water in a vessel adding enough salt and cinnamon, cloves,cardamoms and 1 tsp ghee. Squeeze lemon and pour the juice into this. Saute onion, until semi transparent. Saute garlic ginger and green chilly paste in this. Add chopped tomato,and coriander and pudina leaves. When the tomato is cooked add green peas and rice into this. Greeny and luscious pilaf... looks super duper healthy and delicious!! the lovely green colour makes this a very delicious pulao! What a pretty color Seena, want me to taste! 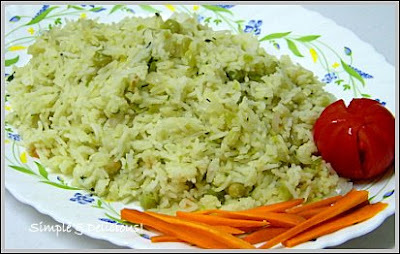 The green color is beautiful, and the rice is fluffy and soft as it should be for a pulao. Nice work. After reading your post I decided to cook rice for dinner tonight. Thanks for the inspiration! This looks really delicious! The colour is so pretty and refreshing! 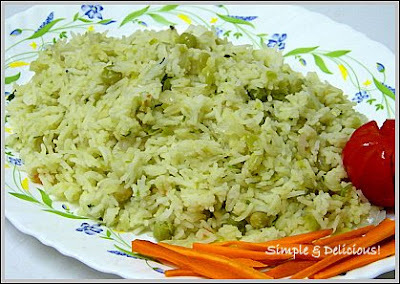 Hi Seena, the pulao looks awesome :) love the green color ! I tried making mint pulao once to get the green color, it didnt work. Your pulao looks great :) Here I was out of blogging world for a while, shifted to a new place.how have u been?